Belize Fly Fishing Guides atTurneffe Flats are the best fishing guides in Belize. With years of experience and intimate knowledge of Turneffe Atoll, it is easy to see why our fishing guides have many return anglers year after year. Dubs is the consummate professional guide who does everything well and with ease. He comes from a family of fishermen, with his first guiding opportunity in 1983, when a local lodge manager came to Dubs' father. The older Mr. Young was too busy, but suggested his 16 year-old son for the day. He did so well that he has been working as a guide at Turneffe ever since. Dubs loves hunting for feeding permit and his easy going, friendly personality make him a pleasure to spend the day with. Dion grew up commercial fishing at Turneffe Atoll with his father and older brother, Dubs. He has been guiding fly anglers at Turneffe for more than two decades and says that his favorite part about fishing is being with the guests. Dion loves to fish for tarpon and permit and says he is always impressed by the size and strength of tarpon. In addition to fishing, Dion loves basketball and spending time with his wife and two beautiful daughters. Mark comes from a family of guides and began his guiding career many years ago at Turneffe Flats. He spent a couple of successful years as an independent guide, and we are pleased to have Mark back at Turneffe Flats. Known as one of the premier guides in Belize, Mark handles all aspects of guiding with ease and competence. His calm, pleasant demeanor makes days on the water with Mark a great experience. He is an excellent caster and enjoys teaching his clients the fine points of saltwater fishing. Daniel grew up in Belize City, where he learned to operate boats at an early age. He began working at Turneffe Flats as a teenager and has been one of our go-to guides for 15 years. An excellent caster and teacher, Daniel takes his guiding very seriously. His patience is a great asset when helping beginner anglers or assisting experienced anglers with improving their casting.. When not guiding, Daniel loves to fish for tarpon. 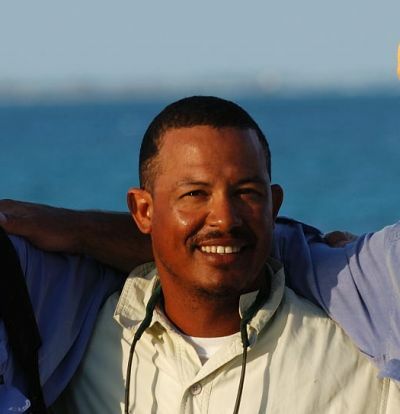 Daniel is also one of our best boat captains and frequently helps with guest services. John's easy going approach, sense of humor, and ability to find fish consistently results in a great experience for his guests. He is comfortable with beginners or expert anglers alike, and enjoys spending time teaching clients the details that will help them catch more fish. John is also an experienced Dive Master and occasionally leads a dive group. These days, however, he spends 90% of his time poling the flats in search of bonefish, permit and tarpon. Kimbral loves fishing and enjoys sharing his passion for fishing with his clients. His favorite fishing is searching for permit. Kimbral is an experienced and patient instructor who believes that the most important element of his job is communicating with his guests and helping them to become better anglers. He says there is nothing better than sharing the excitement with his guests when they land a fish. Pops has been guiding for Turneffe Flats since 1987; prior to that he guided elsewhere in Belize. Pops began working with his family as a commercial fisherman at Turneffe Atoll at age 14, and remembers spending holidays on a small caye at the south tip of Turneffe. Pops is passionate about his bonefishing and has helped develop a number of well-known bonefish flies including the "Pops Bonefish Bitters." Guiding is special for Pops and he takes his fishing seriously. He enjoys the wide variety of fishing at Turneffe including permit fishing and tarpon fishing. One of the first guides on the atoll, Willie has been guiding at Turneffe Flats since 1987. Prior to his guiding career, Willie worked as a commercial fisherman based out of his hometown Belize City. His calm demeanor as well as his vast knowledge of Turneffe Atoll have proven invaluable for anglers of all skill levels. In his free time, Willie enjoys spending time with his family in Placencia. Alton has lived and worked at Turneffe for nearly two decades. For 17 years prior to joining the Turneffe Flats team, he worked as a Boat Captain, Guide and Manager at the Oceanic Society’s Turneffe field station. During that time, Alton oversaw numerous conservation-related research assistant projects where he worked with thousands of students and volunteers. 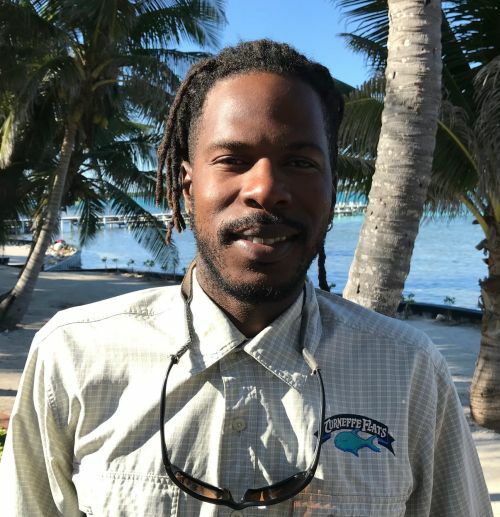 Alton knows every corner of Turneffe Atoll and his pleasant, easy-going manner, scientific knowledge and love of fishing make Alton a great addition to the Turneffe Flats guide team. Chris grew up in Belize City but spent most of his time after age 14 helping his father with commercial fishing at Turneffe. Chris learned to fly fish at an early age and started guiding when he was 16. He loves poling for permit and landing big tarpon. An excellent caster, he also enjoys teaching people how to fly fish. Chris has 20+ years of fly fishing experience at Turneffe Atoll and we are happy to have him on our staff. Erwin grew up in Belize City and began helping is uncle with his lobster fishing business at Turneffe early in his teens. By his late teens, he was working and living at Turneffe Atoll. Several years ago, Erwin moved to the tourism business and became a charter boat captain and then a Rescue Diver. Erwin was trained as a fishing guide by Dubs, Dion, Mark and Daniel and has become a solid and personable guide. He particularly enjoys hunting for permit and also enjoys teaching new fly fishing clients. Eddie guided anglers at Turneffe Flats for more than 20 years before retiring in 2018. He lives in Cotton Tree Village with his wife Eleanor, who was Head Cook at Turneffe Flats for many years. Eddie stays busy with his farm near Cotton Tree and has many relative near by including his son, Mark Hyde and his grandson Alex Anderson.